This paradise for surfers, officially known as the Republic of Maldives, is located in the Indian Ocean. A perfect paradise for surf at your fingertips. A must go location for any surf lover. It´s organized into 26 atolls with the capital in Male, with a total of 1200 islands, of which only 203 are inhabited. When to go to Maldives? 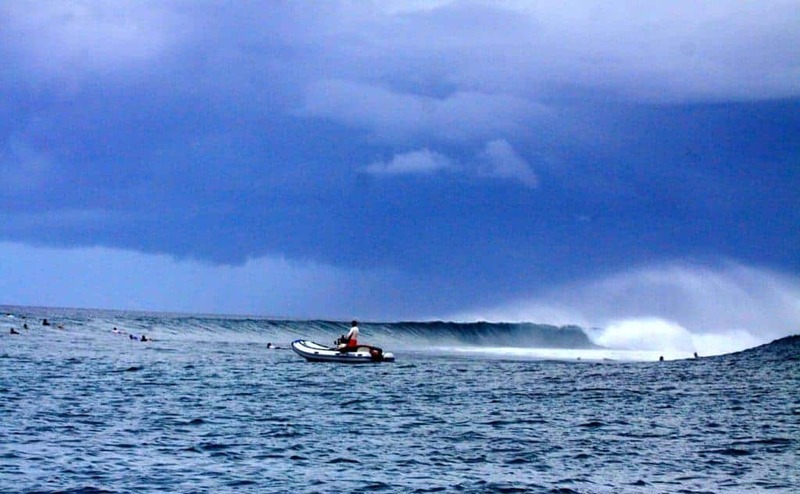 The best season to surf in Maldives is in the Maldivian “winter”. You can check the best season to go to this paradise here. We´ll do a bit of a spoiler and tell you it´s from April to September when the conditions are best. Since its high season and swells being more powerful in July and August. The water temperature is usually around 26ºC – 29ºC all year. That means that you can surf sans wetsuit any time of the year. We recommend that you bring a good sun screen and protect yourself with a shirt from the sun or even a cap for your head. The sun can end up doing a lot of damage if you are not wary, especially if you spend lots of time in the water. The best places to surf in the North of Maldives. Chickens is situated in the deserted island of Villingilimathi Huraa (Kuda Villingili) in the reef north of Male. Excellent left that is made up of two parts with a big lip and perfect for surf. Although the conditions have to be perfect, if not then it´s not surfable. It receives this name because of the chicken factory that’s just in front of the spot. The access must be done by boat. Situated also to the north of Male, it’s found in Thulusdhoo, Atolon. A tube wave with size, it´s one of the most explosive and consistent waves in Maldives. Functions better with medium tide, although, you can surf it with low tide if the waves are sufficiently big and have some strength. Equally need access with boat. Receives this name because of the Coca-Cola factory in front of the wave. The access to this spot can be done by boat or if you are residing in the Hudhuranfushi, right from the shore. 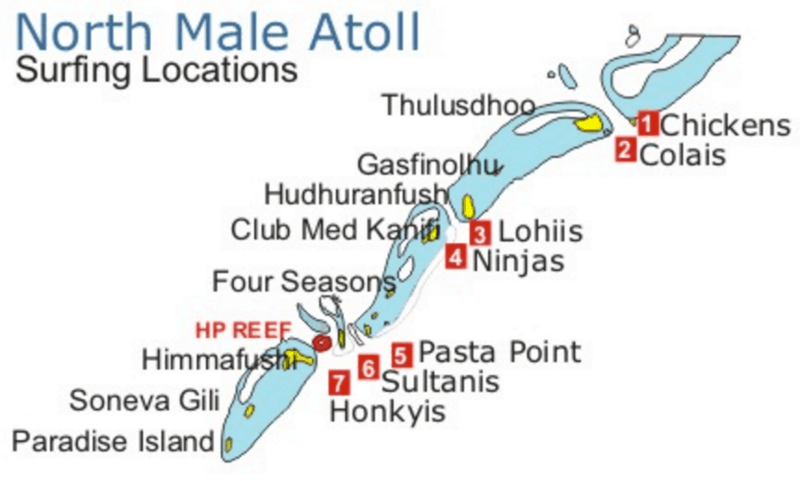 The name of the atoll is Lohifushi. Also situated north of Male. Needs lots of power and high tide to work well. Works better with northwest – northeast and high tide. Situated in the reed north of Male, and with direct access from Kanifinolhu resort is the easiest wave in Maldives. The ideal spot for beginners. Best with a west – northwest wind. One of those places where you have to pass through the cashier. That´s because this wave is reserved exclusively to guests of the Dhonveli resort and has a limit of 30 surfers. Located to the north of Male, it’s the perfect long tube left. Bethany Hamilton is one of the surfers that loves surfing this lovely left. Works well with north wind, but you can surf with northeast – northwest. Best surfed in the months of February, March and April although also works the rest of the months. Sultans is our favorite. A wave that we classify as world class. A long and perfect right. One of the most consistent in the north of Male. Is never closed which lets you do multiple runs and maneuvers. Best in high tide and any wind from west to north is good. Left waves that starts small and grows in size and intensity once in it. Its final section can reach two meters and receives the name of “Fred´s Ledge”. Long maneuvers and tubes through the whole section. Best in low tide except those days with a strong swell. It’s the only wave that works with east – northeast. The best months to enjoy this long left are February, March and April. The months of May and October are affected by strong currents in the southeast monsoon. Like we were saying at the start, sun screen is a must to go to Maldives. Get a good cream or a surf stick for your face. Don’t skimp in price or quantity, it´s better to prevent. A surf cap can also help. It gets dark quick. A good book can help you in those dark hours. Mosquito repellent. Especially if you go to a surfhostel. If you are in a surfboat it wont be as necessary since there are less msoquitos. If you hit your board. Is Maldives a good destination for beginners? Without a doubt Maldives is a good destination for beginners and surfers that just started. But do be careful with big days, you may have to be the photographer that day or go snorkeling. I remember my first trip to Maldives. Surf level initiation – intermediate and I enjoyed every moment. It´s also true that most of the waves were kind. Practically every day they were half a meter – three quarter of a meter, which is perfect. Why is Maldives a good destination for beginner surfers? Let´s say the water temperature, the fact that you can surf in our swimming trunks / bikini and the sights are absolute paradise help. If we also add the waves break in Maldives like a theme park, we have the perfect cocktail for great surftrip. Just the reverse of what happens in our coast (Basque Country) these waves always break at the same place. Once you catch a wave, you can go back to its peak without a problem or doing duck dives. Just paddle wide and go up the peak calmly, without breaking a sweat. If you are caught in a series, stay calm and paddle towards the wave and do the duck with our 5 tips to do a good duck dive. If you are decided that your trip will only include surf, our recommendation is to go to a surf boat. There are a few agencies that organize trips by boat to Maldives. The ideal thing, apart from travelling by boat, is find a pack that includes surf clinic, photographer, and yoga and even massage therapist. Without a doubt, the ideal trip for a surftrip to Maldives. If you are interested in a pack like this send us an email and we will help you. The surf clinics are courses to perfect your surf where you can improve in the hands of professionals. Normally an instructor has the habit of recording your sessions in video to make a video correction later. 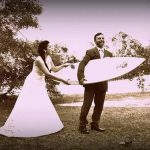 If you remember our post “5 ways to improve you surf level”, we talk about the importance of recording your surf sessions. In fact, in our humble opinion it’s the fastest way to detect and correct errors. Also one thing is what you perceive on the wave, and another what others perceive from the outside. If a professional is added into the mix to analyze your videos, the improvement margin is better. The boat gives you more flexibility. We have done lots of trips to Maldives only by boat and surfhostel+boat combo. This last option is also good since you can live you trip with two perspectives. You go into the water at least 3 times a day. One before breakfast, before lunch and a last one after lunch. Get in and out of the water whenever you want. Surfboats include transport to the peak by motorboat or dinghy in the price. Once you´re ready to return just lift your board so that they can see the nose and they’ll come get you. You´ll be the last one out of the water. The surfboats usually ask their surfers to get out of the water before it gets dark since they have to move to where they anchored. It can seem silly, but those extra 20-30 minutes extra you get are glory. More activities apart from surfing. Surfhostels have swimming pool, billiards, ping pong… just by being on land you get more possibilities to walk around the island and get to know the locals. More spacious room than in the boat. Of course, this depends on the boat and the hostel. The cons of this, staying in hotels, hostels and resorts in Maldives usually include two transfers to the waves. You´ll have less flexibility than by boat and you´ll have to wait for the last surfer before heading back to land. How long do I stay in Maldives? What better than the guys at Volcom to show us Maldives in its entire splendor. Recorded during the months of August to September, the guys at Volcom get their fill in a spot where they were practically alone. If you have any doubts or questions send us a message or an email. But most of all don´t miss our surftrip section for more. You can also subscribe to our newsletter to receive exclusive content every now and then.